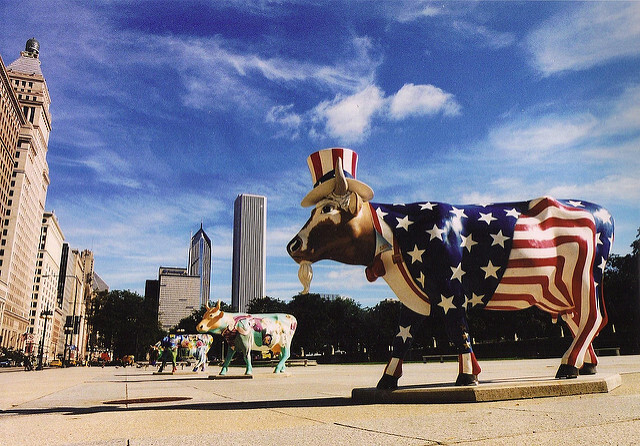 Australia’s Foreign and Trade White Paper —expected next year—will have several sacred cows grazing through its pages, and the holiest of beasts will be the US alliance, a cow of a bipartisan colour. ‘economic diplomacy’, the new beast—the fatted cow of growth and prosperity—twinned by Foreign Minister Bishop , with the need to strengthen and preserve the existing strategic order. Sacred cows tend to be worshiped, not questioned. In the White Paper, though, the US alliance cow will be pushed and probed because of Asia’s shifting balance of power and the China conundrums. The analysis will need to think about the dragon in the same paddock as the alliance cow. The new beast, ‘economic diplomacy’, will be so wonderfully groomed it’ll stand as its own justification—more anointed than examined. This cow is central to the Liberal story about how diplomacy, trade and aid should be done. Here’s Julie Bishop’s proposition: ‘If the goal of traditional diplomacy is peace, then the goal of economic diplomacy is prosperity’. The quote (and emphasis) are from the DFAT  discussion of economic diplomacy and its four pillars: trade, growth, investment and business. The big boast of economic diplomacy is the three trade deals the Coalition government clinched with Japan, South Korea and China. The bilateral magic is to be re-worked in future from Indonesia to India to the Brexiting Brits. The economic diplomacy cow will be one of the bigger animals in the White Paper. Yet there’s a bunch of academic economists sharpening weapons to slit its throat. The professorial posse  calls for DFAT to lose its grip on the centrepiece of trade diplomacy: negotiation of Free Trade Agreements (FTAs). The old arguments throb: FTAs are preferential, discriminatory and diversionary—they give benefits to the FTA partner and deny them to others. Shiro Armstrong’s  assessment of Australia’s 2005 FTA with the United States is that trade diversion caused ‘a fall in Australian and US trade with the rest of the world’. The modelling says the cumulative effect of the AUSFTA was to reduce or divert US$53 billion of trade with other economies. The attack on the ‘free trade mythology’ by the academic posse is that DFAT’s secret negotiation of FTAs involves a misleading process ‘used to create an unreal public perception’ where proclaimed economic gains are ‘without any basis in fact’. No basis in fact! Holy cow! The posse wants to embrace the rigour of the Productivity Commission and give more power to Parliament: ‘DFAT’s grip on trade policy has proved impervious to public challenge and will be removed only by strong political direction’. The professorial posse challenges more than one sacred cow because the economic diplomacy theme flows though much of the Liberal government’s foreign policy, from bilateral deals to the big change in the way Oz does development aid. In its first term, the Liberal government under Tony Abbott: killed off a golden aid consensus that lasted only a decade (completing the Oz journey from aid superpower to aid superwimp ); ordered the greatest revolution in Australia’s foreign policy bureaucracy  since 1987 (integrating AusAID into DFAT  as Pre-FaT ate WasAID ), and quietly killed an iron law of Coalition governments that stood for nearly seven decades (previously the wombats —the National/Country Party—always got the Trade portfolio). The 1997 Howard government DFAT White Paper (In the National Interest ) devoted one of its five chapters to bilateral relationships as ‘the Basic Building Block’, while the 2003 paper (Advancing the National Interest ) grouped five of its 12 chapters under the heading ‘Consolidating and expanding our bilateral and regional relationships’. Behold the sacred cow herd, grazing through the realist bilateral bush and the lush economic diplomacy pasture, contented in the national interest paddock. The sacred beasts do far more than ceremonial duty. They frame the Liberal understanding of the world, defining policy choices and driving political arguments.